The so-called Scrum means an agile software development process and makes any product development efficient, but also challenging. The different stages and complexities you may face when applying the Scrum method is here explained. 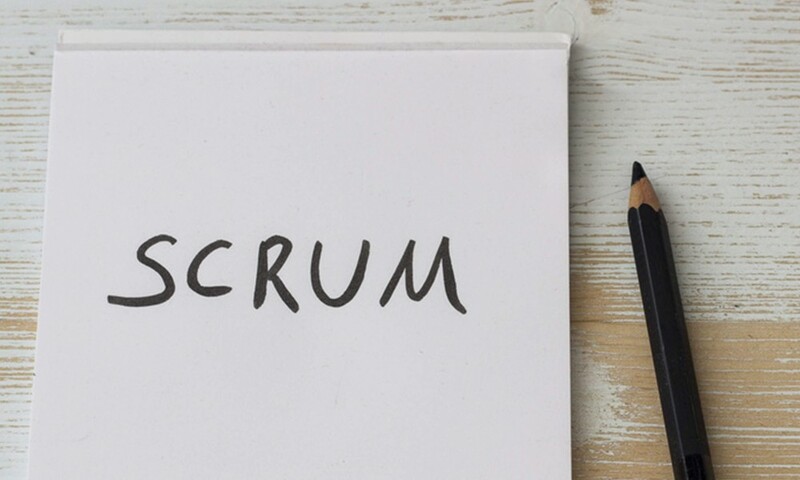 Scrum was developed during the 1990’s by Ken Schwaber and Jeff Sutherland on the basis of Ikujiro Nonaka’s and Hirotaka Takeuchi’s “New Product Development Game.” Scrum is a tool to develop and accomplish complex ideas and exercises so that the value of the product reaches its maximum worth. This also includes Scrim sprints: one team works toward one goal in a defined period of time. 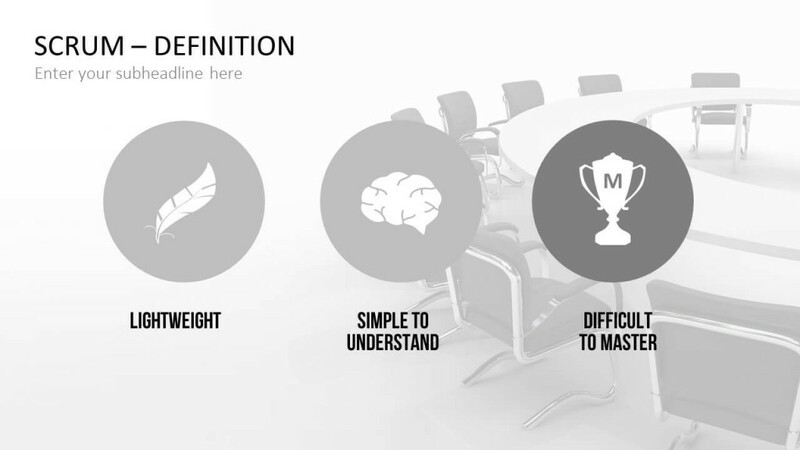 Scrum is easy to understand but difficult to master. There is a clear set of rules and restrictions, but the application of those Scrum instructions requires a healthy team spirit, a lot of discipline and the participation of all team members. The Sprint means a restricted duration for a set of work which shall be accomplished (between one week and one month). At the end of this period, the assignment should be finished so that a subproduct (Product Increment) can be developed. 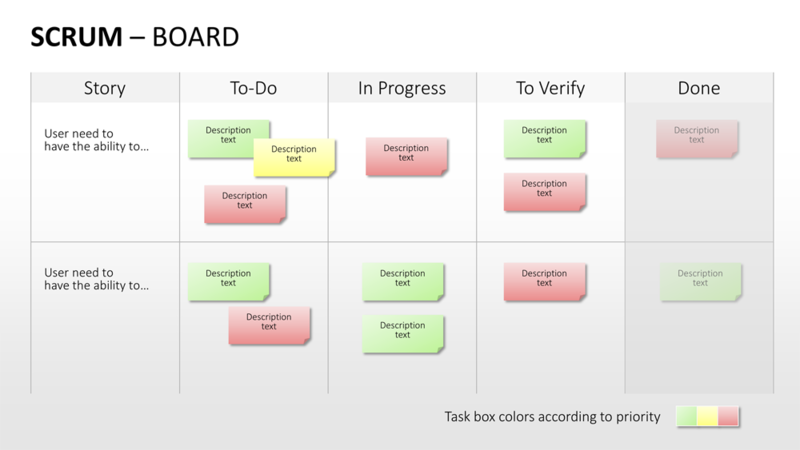 The Sprint requires precise planning and maintenance (Sprint Backlog) which shall be framed by all team members. Consequently, transparency is indispensable. And to guarantee this transparency, Daily Scrum Meetings to exchange reports and progress are required. After a completed sprint there will be a sprint review with an evaluation of results. This is followed by another Sprint where future goals are optimized and improved. Every sprint has its own goal which shall not be endangered by random changes. 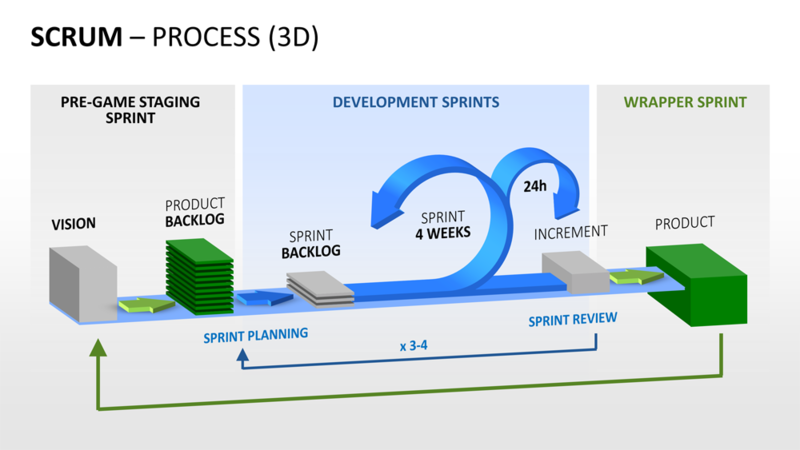 Sprints will be repeated over and over again, until the product development is completed. 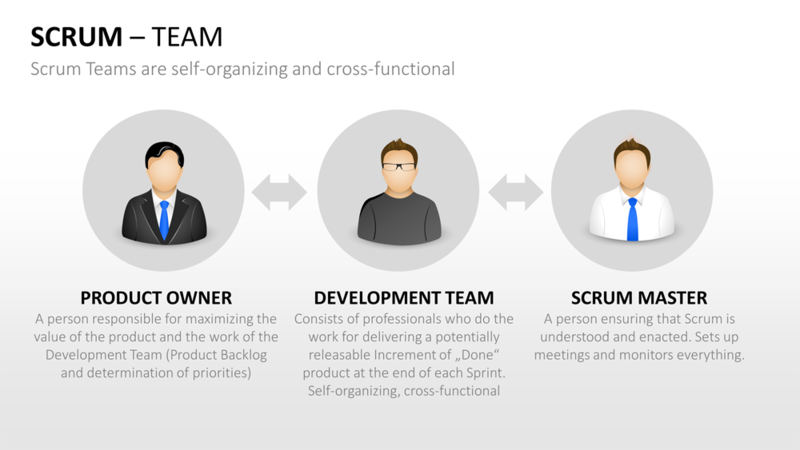 The Scrum Team consists of three parties: the Product Owner, the developers and the Scrum Master. Every party organizes itself and works interdisciplinary. Each team distributes the tasks within and does not rely on a team manager. 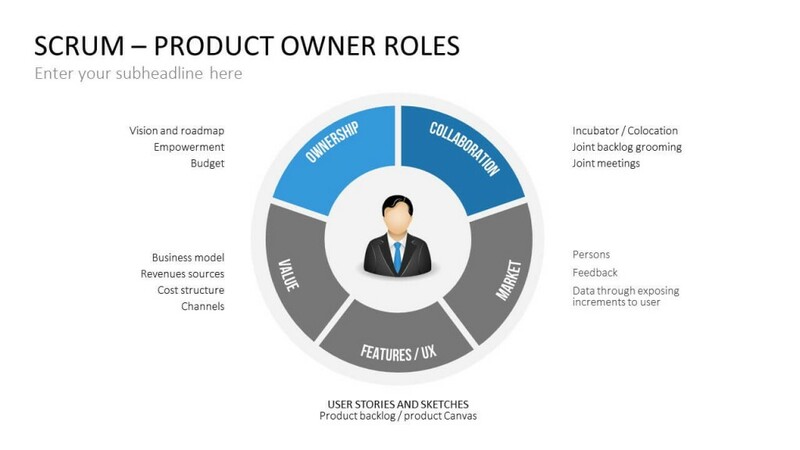 The Product Owner, who defines the goal, is the key figure in this context. He/ she shares his/her idea with help of the Product Backlog, which is a portfolio of all required characteristics, error corrections and improvements that will be adapted. The Product Owner is thereby in constant exchange with clients to learn about their individual requirements. The team of developers consists of experts who are able to achieve the set of goals which were defined beforehand. They will deliver the Product Increment. Every team of developers has between three and nine members. A higher number of team members would mean a higher effort to coordinate the work and therefore endangers the success and the efficiency of the Scrum. The Scrum Master is administering the Scrum process and assures that all restrictions are kept. He works closely with the team of developers but is not a part of it himself. For a successful Scrum adaption, a well-working and well-coordinated team is absolutely mandatory. You need talkative and professional experts, who are ambitious and motivated. Furthermore, the Scrum Sprints increase team work, team cohesion and work efficiency. Permanent exchange, high transparency in the project development and implementation as well as targeted work process optimization lead to time and production cost savings. To simplify your work with Scrum, we have developed a PowerPoint template to illustrate the theory of agile product development. Find 60 pre-designed, high-quality slides to plan and execute Scrum processes. Find useful features on Product Owner, Scrum Master, Scrum Team, Scrum Sprint and Daily Scrums.